Beautiful apartment in a historic house, totally renewed. Located two blocks away from the Cordoba Avenue, very close from the Palermo viejo district - considered to be the most vibrant area of Buenos Aires - this attractive house is just 10 blocks from Plaza Serrano. It is very spacious with over 1,900 sq. feet (180 sq. meters) of indoor and outdoor space. The house itself has 140 sq. meters of covered space (1490 sq. feet) on two levels. At the third level (roof) is the terrace. - one bedroom with air conditioning, a queen size bed and a single bed. The bedroom is in suite with a full bathroom. A steel staircase leads to the second level which offers another bedroom in suite with air conditioning, a full bathroom with bathtub/Jacuzzi and a sofa bed that can accommodate another guest. On the third level is the sunny terrace with outdoor furnishing and a barbecue. The house, is equipped with Gas Heating, Air conditioner in the bedrooms, Wi-Fi Internet access, cable TV, DVD player, Stereo, Telephone, Linens and Towels, Refrigerator/freezer, Microwave, Electric coffee maker, Toaster, Dishes and kitchenware. Weekly maid service is provided. A bright and comfortable option, warmly decorated. Adapted to persons in normal physical conditions. But, with these many stairs, it is not adapted for persons with disabilities or reduced mobility or for families with little children. We are a french-argentinian couple with 3 children (12,10 and 8 years old). Pablo is from Buenos Aires, and I (Sabine), from France (Brittany). I lived in Buenos Aires for 7 years (from 1996 to 2003). And we are happy to know that we still have some roots there, thanks to the house ! We bought the apartment in 2004. We were charmed by the small authentic old building, typical of Buenos Aires, and the ancient architecture of the house. We decided to restore it with the help of our brother-in-law, Federico, who is an architect, specialized in the old historic buildings. But the main reason of our decision, is the neighborhood. In that time, Parlemo Viejo was already a touristic place, but Villa Crespo was still authentic and quite. Sharing a border with Palermo means Villa Crespo is well located, but not being Palermo means that it’s not overwhelmed with foreigners. Its cobbled streets are pretty and there are hip places to eat and drink. You will appreciate the two bedrooms in suite and the spacious living-room. The neighbourhood is very friendly : great local wine bar next door (Cava Jufre), and good local restaurant across the road (Mamma Rosa). Excellent location with access to the metro (Subte B) and walking distance to great restaurants and nightlife. toilet, combination tub/shower, bidet, in suite with bedroom 1.
in the bedrooms. Ceiling fans in the living room and in the kitchen. The apartment is on the first floor (no lift available). There is an old marble staircase, quiet steep, leading to the first floor (kitchen, living-room and first suit). And there is another steel stairs on the first floor, leading to the second floor (second suit and mezzanine). The house is not adapted for persons with disabilities or reduced mobility. Safety Box. Supermaket 'Jumbo' 5 mn walking, with delivery. Laundry across the street. Bank and cash machine : 100 meters. This is the second house we have rented in Buenos Aires in the past 5 years. It was perfect for our family of 4. Very spacious and comfortable with lots of natural light. The location has more of a neighborhood feel vs. staying closer to the center of the city as we did last time. It was very safe and quiet in the evenings. There were many stores, restaurants and transportation within walking distance. Sabine was an excellent host quickly responding to any questions. It was hard to leave but we hope to return sooner than later. We had a great time in Palermo Soho, and this house was perfect for our group's needs. Sabine was super accommodating to ensure we had a smooth check-in, and we enjoyed the wine bar on the corner downstairs and the easy walk into Palermo. Amazing, quiet neighborhood. Uber got us wherever we wanted to go. Hosts were wonderful! Clean, convenient, hassle-free. Hope to return someday soon! Sabine was so very helpful with all of our pre-planning and arrangements. A great rental starting with reliable and helpful communication by both owner and manager. The house has a very large living/dining room with a balcony, two comfortable bedrooms each with a modern bathroom in suite, a solid kitchen, a third half bathroom, an extra space next to the upper level bedroom, and a very nice terrace with a "parrilla". It is very comfortable for a 4/5-member family or two couples. All spaces have good natural light. The house is well equipped overall, with good air conditioning (we stayed during a relatively mild span in the early Summer though). People with limited mobility are likely to have difficulties with stairs. Special mention to location: It has the feel of a true neighborhood ("barrio") in a fairly calm street but at the same time It is a fabulous place to explore bubbling Palermo Soho including some of Buenos Aires best restaurants and steakhouses (just a 10-15' walk) and it is well connected to downtown Buenos Aires by the B-line Metro (the "Angel Gallardo" stop is just 10' away). If you like to walk you have, within 30', the Botanical Gardens, Plaza Serrano. Palermo Hollywood and the Abasto area, among other things. Thank you so much Marcelo ! We hope that we will have the opportunity to welcome you again in Buenos Aires. Thanks a lot, we wish you all the best to you and to your family! Great host, location, the house is very confortable. Very nice, big and clean property. We spent almost 2 weeks in this lovely tipical Argentinian house and we enjoyed it at all times, especially the large terrace with grill. All rooms and bathrooms were spatious and comfy and a lovely decorated living room. Besides the modern industrial arhitecture touch, the staircase is also ensuring you will stay fit after reach meals with Argentinian steaks and wines🙂�. The apartment is located in a very nice and quiet neighborhood, lots of small kiosks around, very close to a big supermarket (Jumbo) and few minutes walk to the subway /metro station (Subte-station Angel Gallardo). Owners were very friendly, helpful and flexible in regards of check-in / check-out times. We were 4 persons spending our vacation together and felt as home so we would always like to return here. 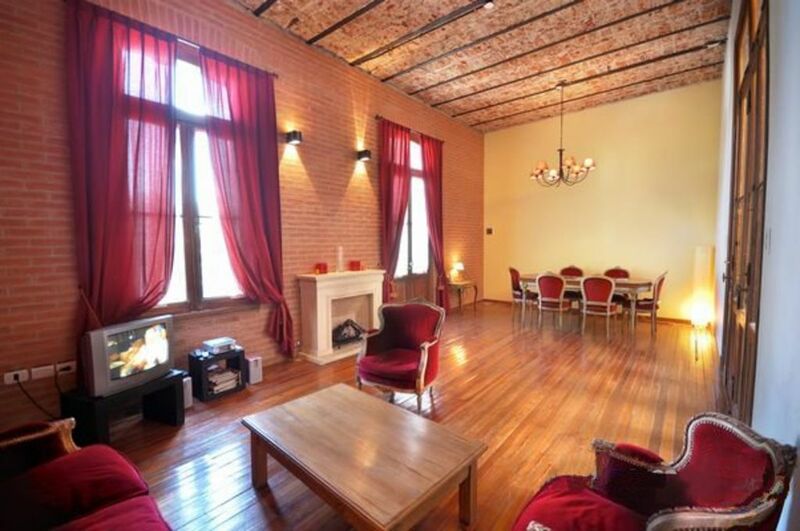 The house is 10 mn walking from the heart of Palermo Viejo, the famous Plaza Serrano. But it is not overwhelmed with foreigners. Its cobbled streets are pretty and there are hip places to eat and drink. You also have close access to Subte B on Corrientes Ave.